Voigtlander Vito II – John's Cameras. Voigtlander’s Vito range of cameras are 35mm cameras aimed at serious amateurs. They date from the 1940s to the 1960s and pre-date the SLR concept. As was normal for the time, they come with several options of lenses and shutters. Initially, the Vito range were folding cameras that were small enough when closed to easily fit into a pocket. My example is a mid-dated Vito II – the Vito II model went through a number of revisions with minor details being changed with each revision. There was one major revision which gave rise to the Vito IIa. I also have an original Vito I. A comparison of my Vito cameras can be seen here. So my Vito II is a 1954 version although the lens serial number shows the lens was made in 1953. So, a basic description. The camera easily fits in a hand (my hand at any road), being 125mm long, 75mm high and 40mm thick when closed. The lens standard is opened by a recessed button on the base – the cover is hinged on the side and the lens comes forward and locks in position. This action is spring loaded but on my camera the spring is not strong enough to fully open the camera. When new, it may well have been fully automatic opening. To close the camera again, two buttons have to be pressed simultaneously and the cover pushed into place. The lens on my Vito II is a Voigtlander Color-Skopar 50mm which is Voigtlander’s version of a Zeiss Ikon Tessar. This lens has a very good reputation. It focusses down to 3.5 feet – this camera uses front cell focussing which is not quite as good as moving the whole lens top focus but this only matters for close to work and for landscapes is fine. The results are excellent. The focussing scale has two Happy Snapper settings – “o” which is the hyperfocal setting for f5.6 and “V” which the hyperfocal setting at f16. When the focus is set to “o” and the aperture to f5.6, the depth of field extends from 15 feet to infinity and when set to “V” and the aperture to f16, the depth of field extends from 5.5 feet to infinity. The lens serial number dates this lens to 1953 although the camera was made in 1954. The lens has a slight but definite purple tinge to it which suggests that it is a coated lens but if it is, it is still, unfortunately, susceptible to flare. Using this camera, it is necessary to remember the advice my father gave me as a child – always keep the sun behind you. The aperture range is f3.5 to f16. The shutter is the cheaper Pronto leaf shutter made by Gauthier and offers four speeds – 1/25, 1/50, 1/100 and 1/200 seconds as well a B. There is also a delay action timer which delays the shutter release by about ten seconds. This is very difficult to use as the setting lever is very close to the struts holding the lens in place. This camera is old enough to need manual cocking of the shutter. The actual shutter release is on the shutter housing but it is actuated by a button on top of the lens cover – there is also a cable release socket at this position. The camera has two safety devices – first, the shutter will not fire if the film has not been wound on so no double exposures and secondly, the winding knob will only move the film on one frame without the shutter being fired. This last can be over-ridden so a part-used film can be rewound into the cassette and then refitted and would on to the next unexposed frame at a later date. This allows the photographer to change between types of film while on a shoot without wasting film. The last thing to mention regarding the shutter is the presence of a PC (Prontor Compur) flash connector. There is no selector to choose between bulb or electronic flash and on the model I have (Pronto shutter) it is for F synchronisation only – i.e. the flash will fire when the shutter is nearly fully open which is intended for fast flash bulbs. With Synchro-Compur and Prontor SV shutters, you would have X and M synchronisation available. Both the film advance and film rewind are by way of a large milled knob – one on each end on the top plate. The back of the camera fastens with a not entirely satisfactory catch. When the camera is in the ever-ready case, this will not matter but I tend to carry this camera in my pocket and I have had the back unfasten itself. The viewfinder is a Galilean type and is rather small. Wearing spectacles as I do, I find it very hard to use as I cannot get my eye near enough to the eyepiece. The only other thing worth noting is that this camera has feet. This is common on cameras of this era (40s and 50s) and the feet take the form of small metal projections on the base plate and the lens door. These enable the camera to be set down on a suitable surface so that self-portraits can be done using the delayed action timer. This is now a favourite camera with only a few niggles. The first is its age – around sixty years old. My concern for its age revolve around the bellows. These are made from some sort of oiled/lacquered cloth and eventually they will start leaking light. I am not sure if I should tackle this by leaving the lens extended all the time and so ensuring that any small leak there might be will leave a significant mark on the film, or whether I should leave the camera closed unless I am actually taking a picture and so hastening then point at which then light starts leaking in. The other main niggle is the position of the shutter release button. When holding the camera, my finger does not naturally fall on the release button and I find my finger searching for it – not exactly helping to ‘hit’ the decisive moment. Third niggle – the viewfinder. It is small. So small I can barely use it while wearing my spectacles. This is a reverse Galilean finder – it produces a small image in the same way that a telescope does when you use it back to front. 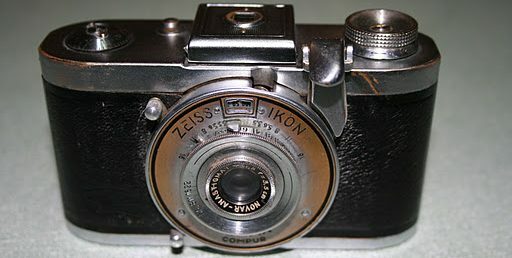 having a built-in viewfinder in a consumer camera was a fairly new idea when the Vito II was designed – Zeiss Ikon were still using folding Newtonian finders on the equivalent (Nettar and Ikonta) cameras. This viewfinder is much the same as the viewfinder in the later Vito B. It was only when the Vito B had been in production for several years that larger comfortable to use finders were introduced (as they were on the new Vito C range that eventually replaced the Vito B range. Apart from those three niggles, I like using this camera. The rewind knob is better than a standard SLR mini lever for rewinding the film and I also like the film advance knob in place of a rapid wind lever.